I have definitely had moments when I have not felt like I was given everything I needed for living a godly life. That has stemmed from my lack of knowledge. In the scripture above, we read that God has given us everything that we need because we have accepted Christ. We are enabled to live it because of His precious promises to us. If you lack knowledge of promises that apply to your personal struggle with living a godly life, you will struggle in your own flesh, ultimately failing and living with frustration. Stay hungry for the word of God, specifically securing a strong foundation of His promises. It will change your perspective and empower you to overcome this world in God’s strength, not your own. God has never asked you to live this life on your own, in your own strength and abilities. He has always intended to live it with you. Thank you, Kathie Lee and Hoda, for featuring my new book on the Today Show! 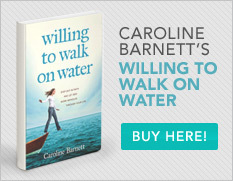 Also, I just found out that Barnes & Noble is highlighting Willing to Walk on Water as their “Book of the Moment”. I’m excited to share these great updates with you! Please click the link to watch The Today Show feature.